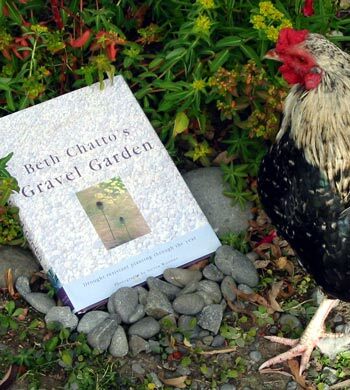 I love the beginning chapters of Beth Chatto's Gravel Garden. It gives me great hope for sensible gardeners who take notice of their climate. This great English gardener is really in touch with earth and weather - I wonder if I could ever be as successful as her? From mid-book on, however, my lack of gardening intellect is exposed. The later chapters seem to be straining with plant names - in full Latin, at least one per line - and I start feeling a bit hopeless. I blame it on being from New Zealand. I don't mean to put anyone else off. It just shows how shallow a 'touch the earth, feel the ambience' gardener is, when compared to Beth Chatto - the supreme and inspiring plantswoman. I'd really recommend reading and re-reading this book - and any others by this author. Sorry about the nosy rooster!